High school injury reports analyzed by InvestigateWest and Pamplin Media show that girls are twice as likely to get concussions as boys in Oregon. Girls in the 13U age group, pictured above, are the youngest allowed to use headers. When it comes to concussion in sports, all eyes are on football, or so it seems. But it’s not just football that causes a high number of head injuries among young athletes. National research has found girls are more likely to suffer a concussion than boys in any sport. 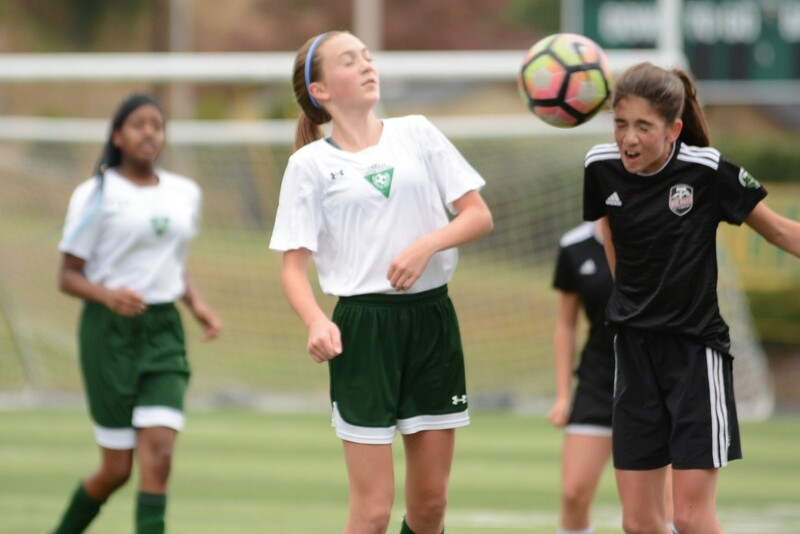 In 2017, researchers at Northwestern University generated national headlines when they found concussion rates among young female soccer players were nearly as high as concussion rates for boys playing football — and roughly triple the rate of concussions in boys soccer. In Oregon, injury reports from public high schools analyzed by InvestigateWest and Pamplin Media Group mirrored that trend, showing soccer concussions were second to those from football between 2015 and 2017. What’s more, at the schools that included the gender of injured athletes, there were nearly twice as many reports of possible concussions for girls playing soccer than boys in the sport. “In a lot of ways, it’s a growing epidemic for young girls that I think has gone unpublicized,” said Chesnutt, co-director of the Oregon Concussion Awareness and Management Program and a member of the Governor’s Task Force on Traumatic Brain Injury. It’s understandable that much of the youth concussion conversation centers on football, given the physical contact that is visibly — and audibly — evident on every play, as well as the large rosters and the lengthy lists of players who are injured. Aerial play brings multiple risks to young soccer players. In addition to the impact of the ball to the head, there’s often head-to-head contact and the chance that a bad landing can produce contact between the head and the turf. 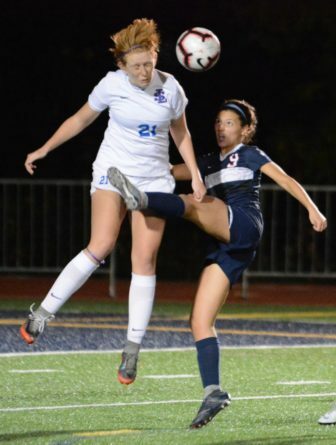 In this photo, Audrey Schelb of Milwaukie’s La Salle Prep and Lake Oswego High School striker Taylor Jones battle for the ball. But if you compare girls soccer with football, and only look at the high school participation and injury data, “you’re missing a gigantic part of the picture,” according to Michael Koester, a doctor of sports medicine at the Slocum Center in Eugene. He directs its sports concussion program and serves as the chair of the Sports Medicine Advisory Committee for the National Federation of State High School Associations. Koester notes that high school boys play eight to 10 football games per season, and typically play other sports in the off-season. “If we’re looking at injury risk by athletic exposure,” which is one practice or game, a standard in evaluating risk, Koester said, female soccer players probably are playing five if not 10 times more practices and games than football players. And Koester doesn’t see the trend ending. Is there a ‘safe’ header? Training players in certain techniques may make them less likely to be injured by header balls. As athletes develop, they take bigger hits at higher speeds, and competitive games build on their momentum. As competition grows in girls soccer, the sport is trending to be more aggressive, she said. According to a study by The Research Institute at Nationwide Children’s Hospital, while headers accounted for 27 percent of concussions, it was knocks with other players on aerial play — including head-to-head contact and arms and elbows to the head — and contact with the ground that accounted for 70 percent of those concussions in girls soccer, suggesting aggressive play is a factor in most concussions involving headers. 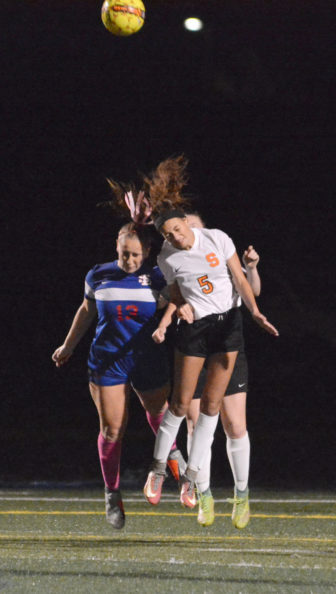 While much has been made of the impact of the ball during headers, coaches and athletic trainers say head-to-head contact is often the cause of concussions. Pictured above, Lauren Whisenhunt of Scappoose High School goes up alongside La Salle Prep’s Lauren Nebels to play a header. It’s also possible that girls don’t benefit as much from early treatment. A recent study published by the American Academy of Pediatrics found that girls are five times more likely than boys to stay on the pitch and play through a head injury. And the soccer community has been slow to recognize the hard hits its girls are taking. Instead, soccer is at the forefront of the cultural empowerment of girls. “The worry is that the take-home message is that (girls soccer) is healthy and fantastic and nothing can be bad about it,” said Koester, who says an opposite negative message, equally extreme, is more often associated with boys playing football. “I think the way to decrease it is to really analyze how we can modify the amount of body contact that goes on in soccer to limit the dangerous aggressive behavior that is associated with concussion,” he said. Unlike youth football, a sport that’s adjusting to new information about concussions all the time, soccer has largely failed to address new information about concussions, Chesnutt said. Rest, training and prevention are key to keeping young athletes healthy. And because evidence suggests that young soccer players are more likely to suffer concussions on head-to-ball contact that they’re not prepared for, training for aerial play is important.